ABSAF crankshafts are made to the highest standards possible today, from the strongest types of steel. The flywheels are forgings which are surface hardened. The big end bearing is a modern needle bearing 35 x 42 x 20mm. Together with the lightweight steel connecting rod these crankshafts are reliable and durable. • The standard crankshaft is great for most kinds of Gold Stars, for moto x, touring and racing. It has an 88mm stroke. • The 600cc crankshaft has a 92.5mm stroke instead of the 88mm stroke it has a 92.5mm stroke which in combination with the 90mm cylinder gives 588cc. • The lightweight crankshaft also has 88mm stroke, but due to the unique shape and size it has very low inertia. It is only used in our full race magnesium engine and it is not suitable for purposes other than top-level racing. 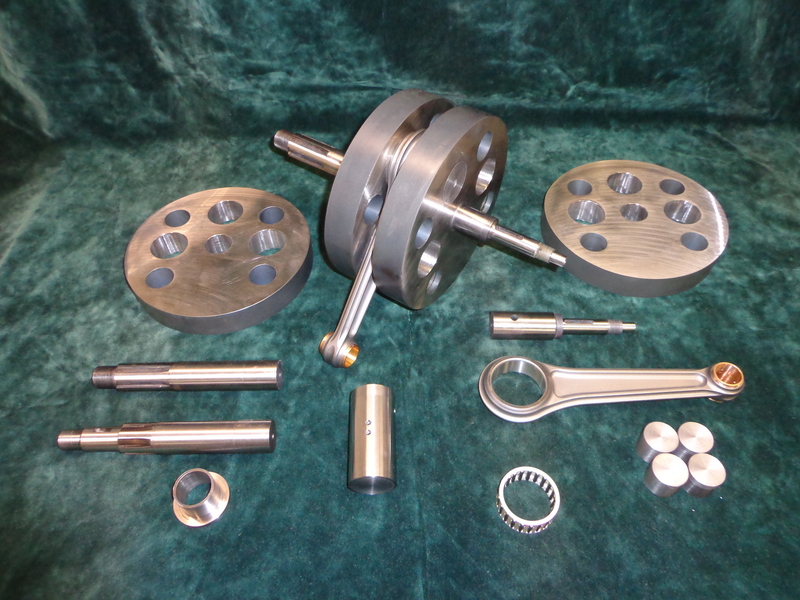 • All crankshafts can be supplied with mainshafts for original bearings or for up-to-date superior metric bearings. • Alternator type mainshafts available on demand, as are the primary chain cases for alternators. • Timing covers are available in original type or magnesium.